You are here: Home » Talbot Run Friends-March with Us At the Lisbon Horse Parade! Talbot Run Friends-March with Us At the Lisbon Horse Parade! Please join us on December 13 and celebrate the holidays! We will be marching in the Lisbon Horse Parade. Our theme is All Creatures Great and Small – dress as your favorite animal with a Christmas flair! We will be walking with our friends Glory, Wave and Cheyenne. Bring a donation of food for the Lisbon Food Kitchen. We will meet at 9 am. in Lisbon – at the gathering area (see website). Its a lot of fun and a great way to spread Christmas cheer. 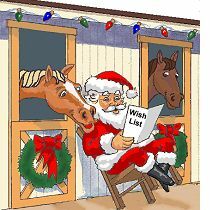 See the website www.lisbonchristmashorseparade.org for more information! If you are coming – please let Ann know at talbotrunec@aol.com. ← Lessons Cancelled Tonight – Wednesday!